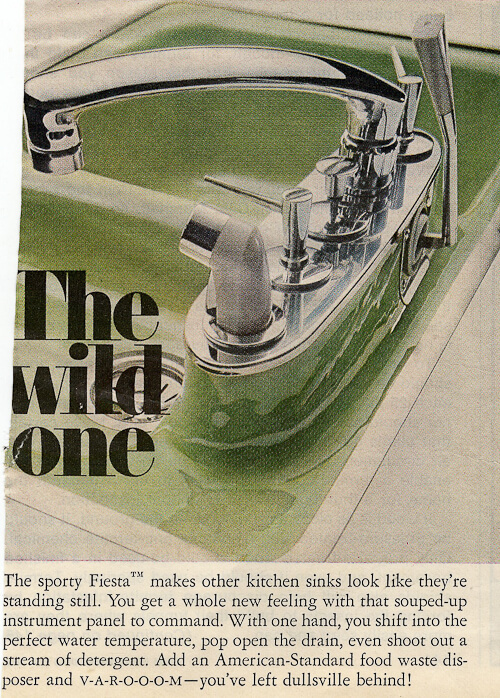 Here is the latest wonderful oddity — “woddity” — to go into our archive: The Fiesta sink by American Standard. I have seen reference to it as early as 1966. Click on through for some additional, great colors, sculpted round designs (!) and strange lever thingy. I also have seen it in variety of sizes and in 6 colors so far — white, as show in reader Justin’s kitchen (above)…in avocado (lead photo) spotted as New Old Stock at my Re-Store — and holey moley check out the vintage advertisement that I found on ebay (below): The sink also was available in what appears to be a limier green, a persian red — AND in orange and in a sculptured round bowl model. Yowza! I also found a 1969 ad among my stash of vintage marketing material that gives a good look at a lever thingie on the back. It’s like an old “shift on the steering column.” What is this for???? Above: The text of the ad. Indeed, the marketers from American-Standard are comparing this to a speedster… I learned to drive manual on my Dad’s circa 68 Datsun truck — yes, a shift on the column. What a nightmare for a 16 year old — but I am a rockin’ Amazon woman warrior for the experience. 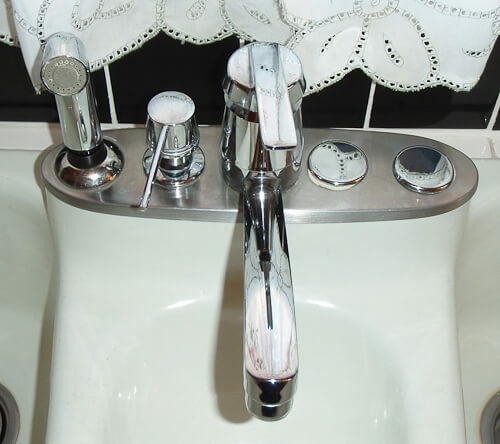 That original faucet design also reminds me of instruments of torture used in dentists’ office. Also check here at Locke Plumbing. Indeed, you can still get a Fiesta faucet. No lever, though. Here is another shot of Justin’s sink. No shift lever though! Hey, I see in Justin’s email, that he says, “The drain levers are much harder to find.” So: It’s a lever to pop up the drain??? And above: The guts of the hole that holds all the faucet hardware. Come to think of it, the “idea” behind this design must sure have been to consolidate all the holes on sinks — up to 5 — into one. 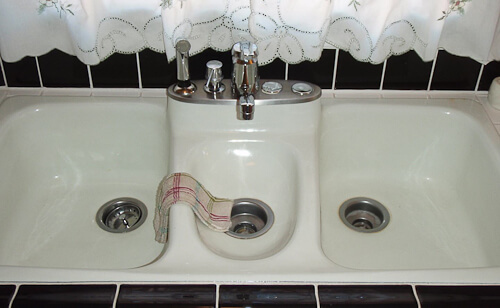 Control the chaos on the top of the sink — and minimize the need to make separate 1-, 2-, 3-, 4- and 5-hole versions to suit anyone’s need. Kind of a good idea, actually. I have this sink with the two pull knobs to open/close the drains. The knobs pull/push cables connected to levers under the sink in the drain pipes. These levers move up/down and lift/lower plastic drain plugs. If you can tell me what is wrong with them, perhaps I can explain how to fix them. Also, I have the original faucet with the “shift lever” water control. It worked great until last year when our city replaced our water mains. When they turned the water back on, all my faucets quit working due to tiny pieces of black plastic. I cleaned them all out, but the faucet started dripping very slowly, and nothing I did would make it stop. I had to replace it with a new faucet, but I still have the old one. If someone wants to try to rebuild it, I’d be interested in selling it. Did you sell your faucet…I am looking for a replacement. I have the white sink pictured above. Thank you. 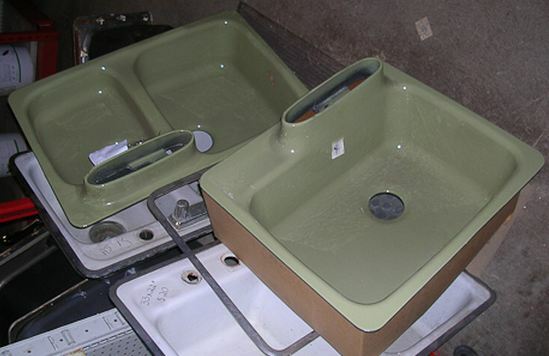 could I see what your faucet and sink look like put back together….I am looking for a replacement faucet. I have the three bowl sink like the white one above. Thank you. I have no idea how to post a pic. I used an IKEA HJUVIK faucet BUT YOU HAVE TO HAVE the deck & screws I mentioned above or you can’t install any faucet. Call the guys I listed or buy the one on amazon but make sure it includes the deck, under plate & screws. A lot of the IKEA faucets will work on that deck. A good plumber can set it up. it is MUCH easier if the sink is not installed. but then you need 2 people to get the bloody sink back in place. Oh, by the way. Using the IKEA makes it NOT look mid-century so if you want authentic, go with faucet that was meant for it. I am not a stickler for any era. 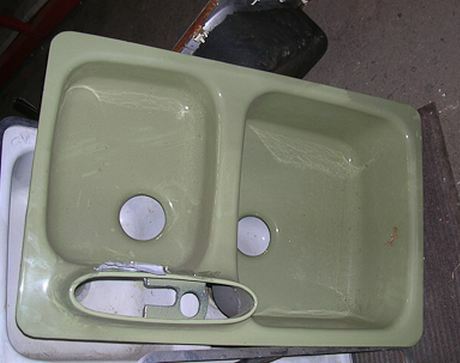 I just love weird plumbing & many old styles… so it depends on if you want a fun sink or are interested in a 1970’s kitchen…. The blog code does not allow for posting photos directly into a comment. You must post them somewhere online then post the url here.